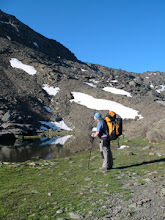 It's June 2006, we have toiled up the final pull to reach Puerto de Trevelez on our high level journey amongst the Sierra Nevada Mountains, the second highest of Western Europe's moutain ranges. We looked eastward, and think we really should explore those lower peaks, which though lower appear just as impressive and imposing. We then continue on our route to the west. The following winter, we were looking again at the map and Mike said "what do you want to do for your summer holidays?" How about walking the entire ridge I said. You can drive to 2000 metres; why don't we do that, then walk the whole way back! We had had a number of forrays amongst the high mountains, sometimes on our own, others with friends and paying clients. However there was still much to explore and a few bits that kept getting missed. We looked again at the map and started to plot our route which we thought would need 6 or 7 days. June is the ideal time for walking in Spain's highest mountains. Although there are likely to still be patches of snow, this also means plenty of water and some beautiful alpine flowers which are at their best following the snow melt. There are only 2 hotel style refuges in the Sierra Nevada (neither of which would be on our intended route), so we would need to carry food and a tent just in case of bad weather or for the days when it was too far between the many bivoac shelters. So the seeds were set for our latest journey, which was to prove the hardest, but best among these facinating mountains of which we just don't seem to tire.